As Khal Drogo in Game of Thrones, Jason Momoa fearlessly led the Dothraki across the unforgiving continent of Essos. Now Jason finds himself leading a similarly thirsty tribe; a global community of women who cannot get enough of his wolfish good looks and long, tousled hair. Following the 2012 release of The Avengers, RogerEbert.com reviewer Jim Emerson pondered over the phenomenon of a ‘critic-proof’ movie, which ‘doesn’t need critics and critics don’t need it’. Whether somebody ‘likes or dislikes’ something is not something anyone else can do anything about, and therefore is not a fit subject for criticism. I saw Aquaman. The people who say it’s great are wrong. Aquaman could be argued to fit the definition of the ‘critic-proof’ movie, having steered through a fair few mixed reviews to achieve a phenomenal $748.8 million at the global box office. This figure comes after a dazzlingly successful $67 million opening weekend. Aquaman is a mess of clashing tones and shameless silliness, but a relief after all the franchise’s recent superhero gloom. No wonder he [Momoa] rarely seems excited to be here. There’s nothing to be excited about. Aquaman is so much like parts of Thor and Black Panther and Avatar and The Jewel of the Nile and so reliant upon an ancient British legend that you don’t know why the people who made this movie bothered. However, Aquaman has been making waves with audiences despite such reviews, with fans warming to the self-aware wit and sense of fun. Surpassing the $1 billion worldwide mark would not be a supernatural feat at this stage. And there appears to be little mystery as to Aquaman’s ocean of success. As reported by Deadline, there is a certain demographic who are very much enjoying Jason’s performance. Deadline have reported how women over the age of 25 are the demographic most likely to love the film, with more women coming to ogle Jason – sorry, watch the movie – than men. As reported by Deadline, mothers are out-numbering fathers at Aquaman viewings, 52% to 48%, with 82% of women and 60% of men enjoying the tale of the handsome half-Atlantean/half-human. 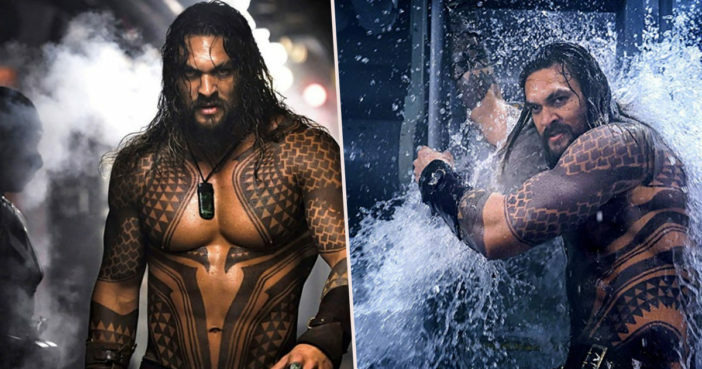 Thanks to Aquaman, DC Comics has been catapulted beyond the $5.3 billion worldwide mark for 2018, bringing a welcome breath of fresh sea air to the DC Brand. Arthur Curry can manipulate the tides and speak with sea creatures like a true superhero, and it appears his communicative powers of persuasion expand far beyond his underwater realm. Audiences are generally on board with Aquaman then, and indeed with Jason. Aquaman has been available to watch in UK cinemas as of December 12, 2018.